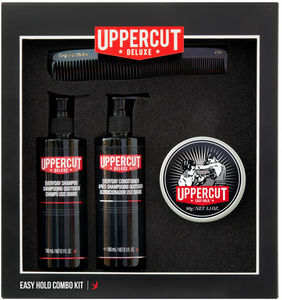 Uppercut Deluxe Easy Hold has been specially designed to give texture, volume and control without visible residue in the hair. Uppercut Deluxe Everyday Shampoo is infused with Liquorice and menthol, invigorating both hair and scalp while the light lather hydrates the hair without leaving it limp. Uppercut Deluxe Everyday Conditioner is infused with olive leaf extract to invigorate and soothe hair and leave hair feeling clean with a fresh scent.